Home News Kudos to you! Motivational strategy for healthier employee relationship. 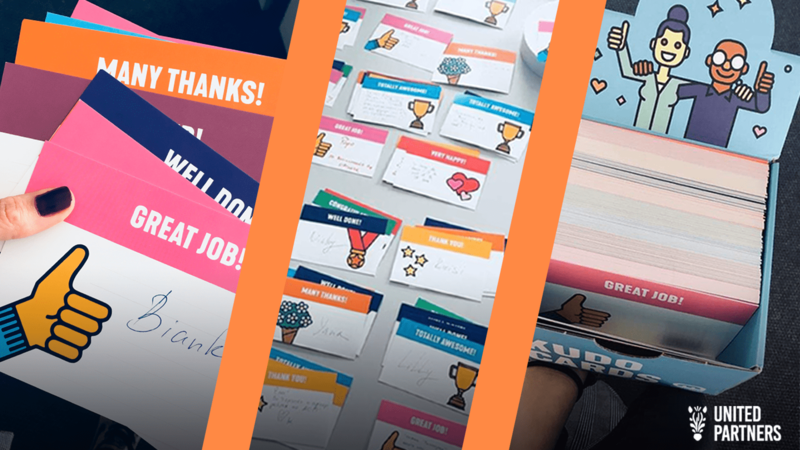 We recently found an amazing way to help our employees show appreciation for each other’s work. A simple, direct, easy to use system that is not affected by internal hierarchy. You’d like to know more? We bet you would! Ok, so some companies call them HERO awards, others Rippas or Hugs, we call them Kudos. It’s a written and public recognition of a colleague for something he or she has contributed to the team. Kudo Cards are simple cards that play the role of a physical token of appreciation. The cards can be placed in a box and every now and then the Kudo Box is emptied and the workers celebrate those who had received a card. We placed ours at a central place in the office, we explained everything on a common meeting (with a follow-up email for the ones who couldn’t attend). Then we waited… The cards are colourful and read up simple messages, including among others Great Job, Proud!, Totally Awesome, Many thanks or Well done. The approachable design was appreciated by many and the box started filling up from the very first day. We would use the cards not only from the top down, but also in a peer-to-peer way and even the least qualified employees were welcomed to comment and reflect on their superior’s work and behavior. In bigger companies: across departments and organizations, anyone can recognize someone else’s work. It’s a way to break down hierarchical limitations and to encourage everyone to offer instant positive feedback. It can feature a short personal message, or only the recognized person’s name. Furthermore – it can be totally anonymous, if you like. And it’s totally awesome! Why? Because usual barriers, related to hierarchy, personal limitations or just shyness are broken trough. Surprisingly enough sometimes, people feel more at ease to leave a message in a box, than to go directly to the person and say “Thank you”. It may have to do with their personality, or they just might think it’s not appropriate (because the colleague they want to thank is actually a superior or works in a different department). Also, by using this system the recognition becomes public! So everyone can appreciate the good work and dedication of a colleague, even the ones that don’t work on the same project. Isn’t that a great, genuine way to shift the conversation towards a more positive direction. Instead of constantly discussing ongoing struggles and issues – let’s start talking more about our successes and achievements! Why only learn from your / other people’s mistakes, when you can also get inspiration from the good practices of your colleagues, right? Our first “winner” from the KUDO card box was Bianka. Known for being the newest member of the agency, she got some positive messages from her colleagues, aiming to make her feel more as part of the family. Her peers chose to congratulate her for successfully handling her campaigns and blending with the team. Other more senior employees were praised for their successful projects or for work anniversaries in the company. Our CEO also received positive messages for inspiring the team and setting up positive initiatives. As we collectively received so many KUDOS for team efforts, we decided to pin those on a board and put it in a wall to inspire the good work! Next month we’ll chose a new winner! To sum it all up – incentives like the Kudo cards are an organic, fun and innovative way to prompt positive communication between employees. And, after we started using the cards in our own office we found they also create something very special for the receiving person. According to our colleagues, getting a Kudo card feels as if you are actually rewarded for your efforts. Rewarded in a way that triggers intrinsic motivation: it’s effective, sustainable, and for instance – costs less money.